We left Fredericksburg around 9am, heading West towards Big Spring, Texas. Everytime I drive out of Texas I am reminded of how gosh darn huge this state is. If you try to drive from one end to the other (either East/West or North/South) it will probably take you about 24 hours, including stops. We don’t really like to drive more than five or six hours in one day so we planned multiple stops on our way out of Texas. I planned all of our stops out of Texas using a program called Harvest Hosts. 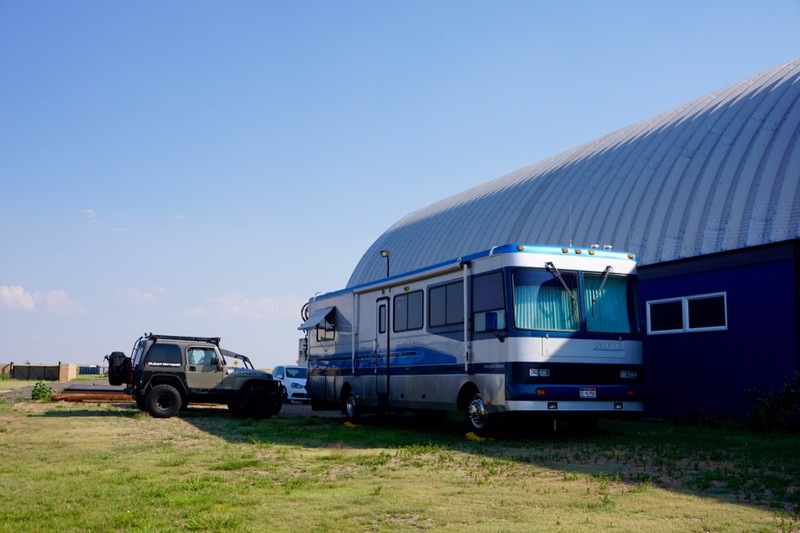 Harvest Hosts is a network of farms, wineries, and museums that allow RVers to camp on their property for free for one night (additional nights can be negotiated between the camper and host). Utility hook-ups are not guaranteed and I’ve heard that most places don’t offer them, so you need to be self-sufficient for at least the one night (not a problem for us). To join the program for one year we paid $44, which gave us access to the Harvest Host directory of host sites. Although the camping is technically free, Harvest Hosts suggests that you either purchase something that the host sells or make a donation to their business (generally at museums). And really, this is just the right thing to do. I suspect most of the hosts join the program to draw business and it would be rude to leave empty-handed. Our first Harvest Host was the Hangar 25 Air Museum in Big Spring, Texas. The museum is tucked away in the back of what appeared to be the old municipal airport. The area is currently being used as an industrial area. We saw lots of construction equipment being stored and big rigs waiting on repairs. There is also a Federal Prison nearby. You can see the fence topped with constantine wire from the Hangar. We were warned by the host that the prison was nearby, but I wasn’t really too concerned. The prisons I’ve toured (as a courthouse employee, not a criminal) were very secure. Or maybe I just got really comfortable while working in the criminal justice system. The museum houses a small (and dusty) collection of planes and memorabilia that showcase the Hangar’s history as an Air Force Base. 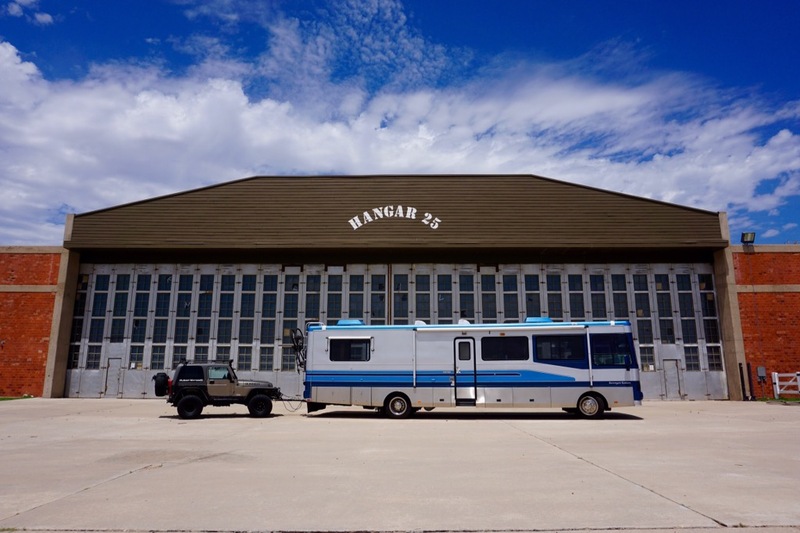 Hangar 25 was an operational Air Force training facility through WWII, Korea, and Vietnam. During WWII it functioned as a secret Bombadier School. Bombardiers were trained there to use special equipment that allowed them to accurately see what they were about to drop a bomb onto (ideally, avoiding civilian casualties). The Hangar was retired as a training facility after the Vietnam War. The museum runs entirely off donations and volunteers, and to be honest, could use a little love. 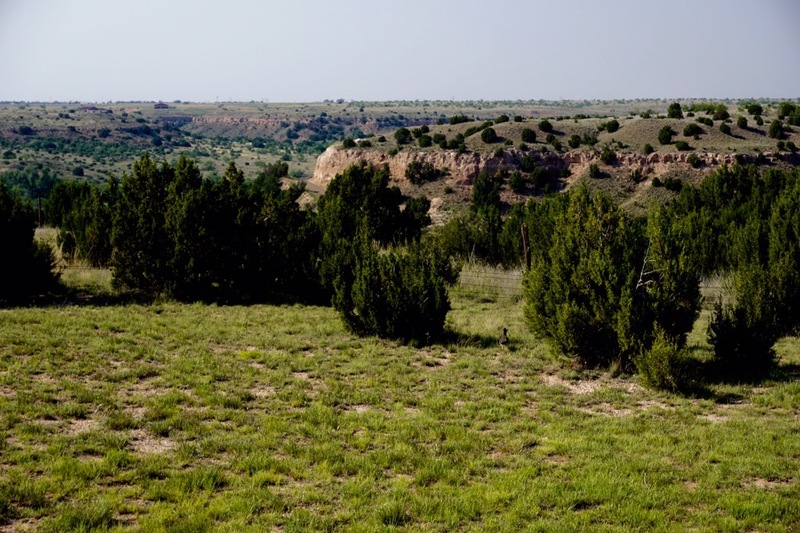 Being located in a small down in West Texas does not attract a large number of visitors. Looking at the sign-in book, they appear to average one group of visitors per day. We made a donation even though we had already decided against camping at the Hangar. It was just too hot (over 100 degrees) to spend the rest of the day parked on a concrete runway with no air conditioning. The best exhibit at the museum was the nose of a B52 bomber. They let visitors crawl inside the cockpit and check out all of the equipment. It was dark, hot, and stuffy, and there were more knobs, buttons, and switches than I could have ever imagined. Getting inside the cockpit also required climbing up two very sketchy ladders. As cool as this experience was, as a lawyer, I thought it was insane. I saw liability and the potential for injury everywhere. There was no waiver, no warnings, and no supervision. They just told us “Yeah, climb up inside and check it out!” and left us to our own devices. Although this was a nice throwback to a time when Americans were not so litigious, suing each other over even the most inconsequential of injuries, I could not help but be concerned for the museum. The cost of defending just one personal injury law suit could potentially shut them down. Like I mentioned, we abandoned the idea of camping on the tarmac because it was just too darn hot. This turned out to be a good call becuase a storm came through that night with very powerful winds and lighting. Parked on the Tarmac with nothing to buffer the wind might have been a bit intense. Our spot at the WhipIn RV Park was pleasant enough. The park wasn’t much to look at but the owner was nice enough to accommodate us at the last minute. For the most part, the park was home to traveling oil field workers. We were only there overnight so we didn’t see them much, but we noticed a number of mobile welding trucks. The following morning we continued our way north on Highway 87 and toward our second Harvest Host attempt, the Bar Z Winery in Canyon, Texas. 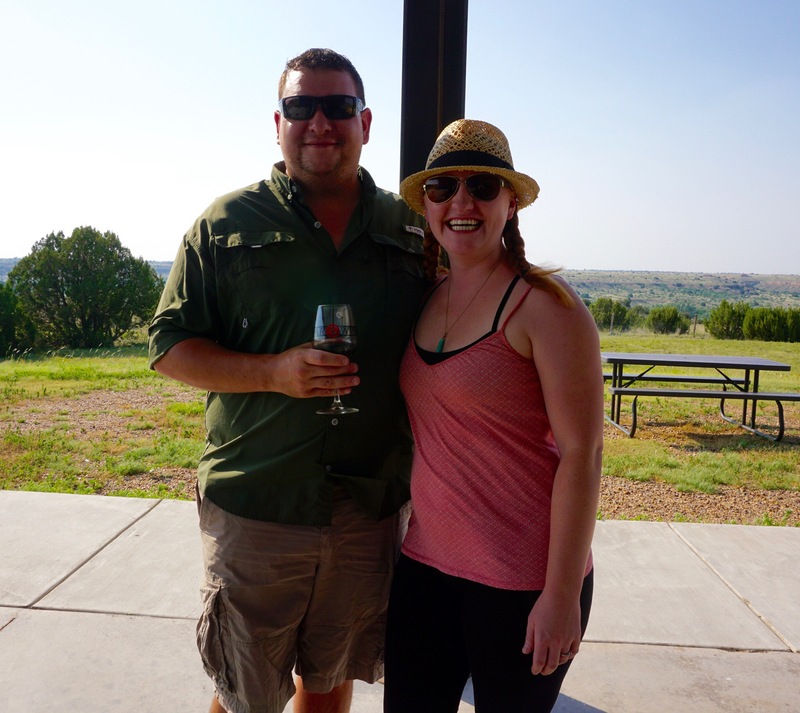 The winery is about 30 minutes away from Palo Duro Canyon, the Grand Canyon of Texas and somewhere my Auntie Lyse had encouraged us to stop, but by the time we even thought about going hiking we were well on our way to being very drunk after hanging out with the winemaker and his staff. Bar Z turned out to be an amazing Harvest Host stop. 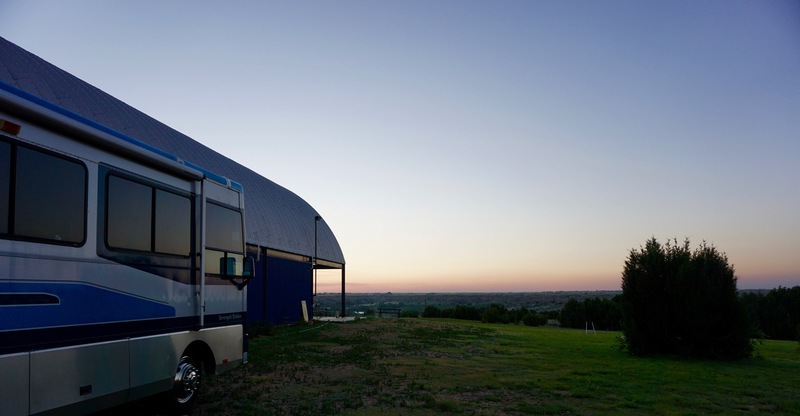 The owner and winemaker, Monty, lived in a travel trailer on the property while he and his wife built their house. Consequently, he has two hook-ups set up for friends and harvest hosts, one on each side of the winery. The West side has a full hook-up with 50 amp electric, water, and sewer but is not shaded and can get very hot in the afternoon sun. We chose the East side of the building with water and 50 amp electric because all we really wanted was electricity or run our air conditioner. The view from our spot was incredible. Monty could charge for this spot if he wanted to. We didn’t know that a hook-up would be provided when we arrived (Harvest Hosts are not required to provide them), but we did come with some idea that the winemaker was an interesting fellow. Our friend Doug Lewis knows Monty from some of the Texas wine industry events and told us that Monty is quite the character and that we should make a point to chat with him if we get the chance. Our visit started off like any other winery visit. We ordered two tastings and proceeded to make small talk with our server and comment on which wines we liked. Anna, the winery manager and our server, was very sweet and made us feel very at ease. 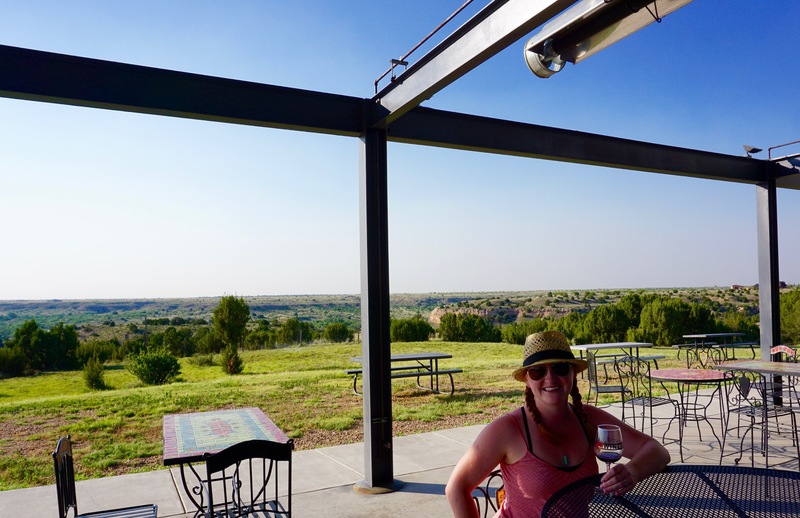 When we’d finished our tasting we ordered two glasses and went to sit on the porch overlooking the canyon (not Palo Duro Canyon, but a smaller canyon adjoining the winery property). Before long, Monty, Anna, and Lauren (another winery employee) had joined us on the porch to drink wine and smoke cigarettes. 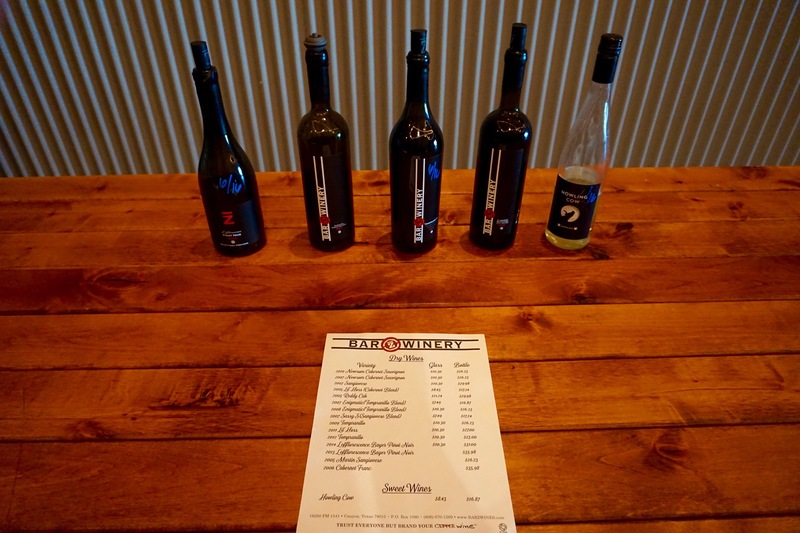 Unlike some of the wineries we visited in Oregon, Bar Z was delightfully unpretentious. It was early in the evening, around 5 or 6 pm, so technically the winery was still open for business. Bar Z has to keep unusual hours for a winery because they are the only one in the area. Most tasting rooms are open regular business hours (9 to 5) but Bar Z keeps bar style hours (3 to 10). Today, however, we were the only people there and all of the employees were hanging out with us on the porch. There was one other visitor to the winery that evening. A couple (with an adorable pit bull named Frankie) bought a bottle of wine and hung out on the back porch to watch the sunset. 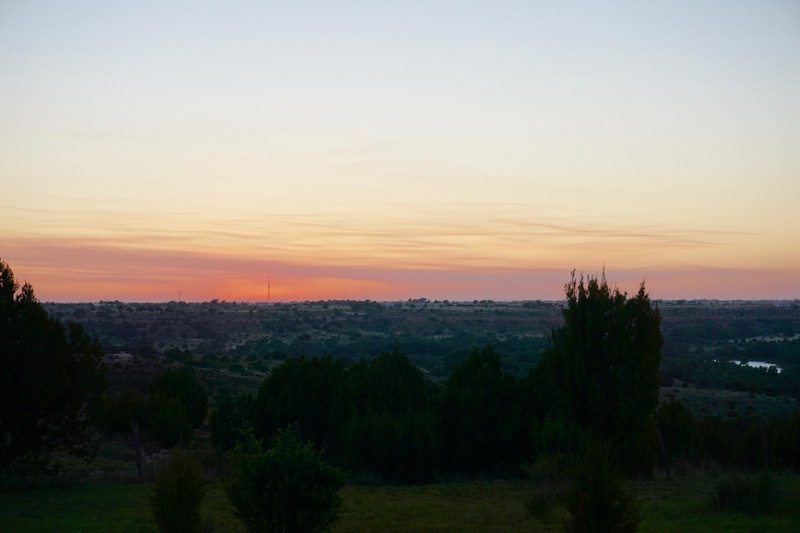 After the couple left, the five of us continued drinking wine and enjoying the sunset on the back porch. We all stayed up drinking till around midnight. Around 10pm we suggested opening a bottle of the Lewis Wines rose we had back in the RV. Monty told us he had an even better idea and disappeared into the tasting room. He returned with small glasses of green liquor that smelled like licorice. It was absinthe brought back to the states from Switzerland. Monty told us that when European countries were cracking down on absinthe during the early 20th century, governments were not only destroying the stills but also burning the recipes. However, the family recipe for this particular brand of absinthe survived, meaning that the contents of our little glasses tasted the same as they would have during the 19th century (minus the opium, of course). Monty was full of crazy stories, like the time he ran the Cannonball Run and came in 7th, and we thoroughly enjoyed visiting with him. We also really enjoyed the wine at Bar Z, but the people were what made it special. 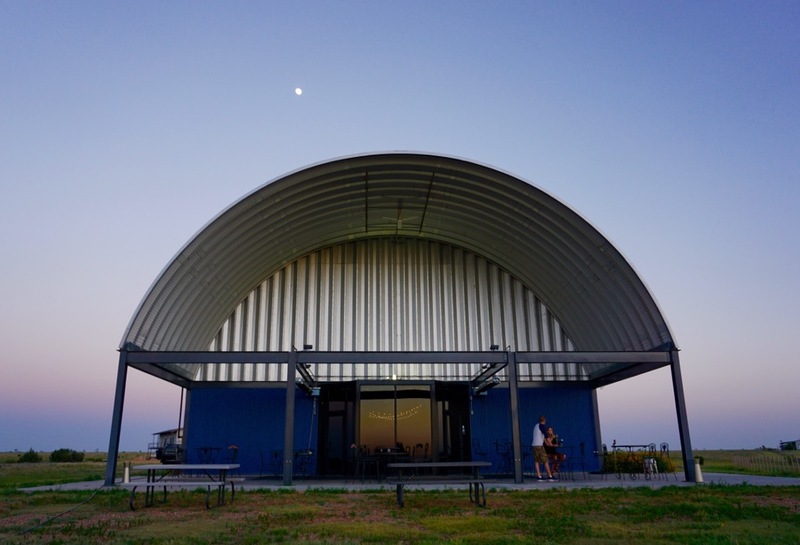 We highly encourage stopping by the Bar Z Winery if you find yourself in the Texas Panhandle, you won’t regret it. By the time we stumbled back to the RV we both realized we had entirely skipped dinner (no doubt contributing to our drunkeness). After eating some leftovers and drinking copious amounts of water we both went to bed, anticipating a rough start in the morning. We woke up the next morning around 10:30am feeling less than stellar, but honestly, I was expecting worse. We took some ibuprofen and got the rig ready to roll. After saying goodbye to Monty we left a thank you note for the staff taped on the back door. We will definitely be back. We were finally on the home stretch out of Texas! 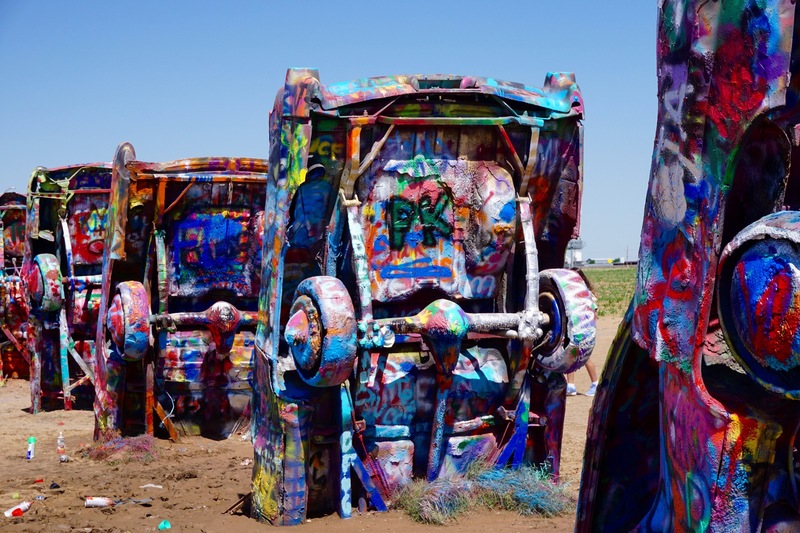 Crossing the first state line felt significant and exciting, but before we truly left Texas we had to make a stop at a classic roadside attraction outside of Amarillo: Cadillac Ranch! 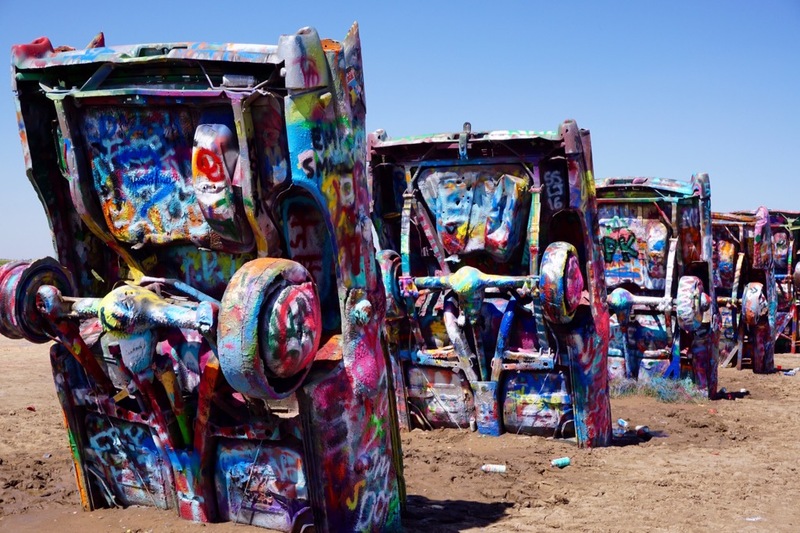 Cadillac Ranch is a long-term art installation that consists of eight vintage cars buried nose down in a field next to I-40. 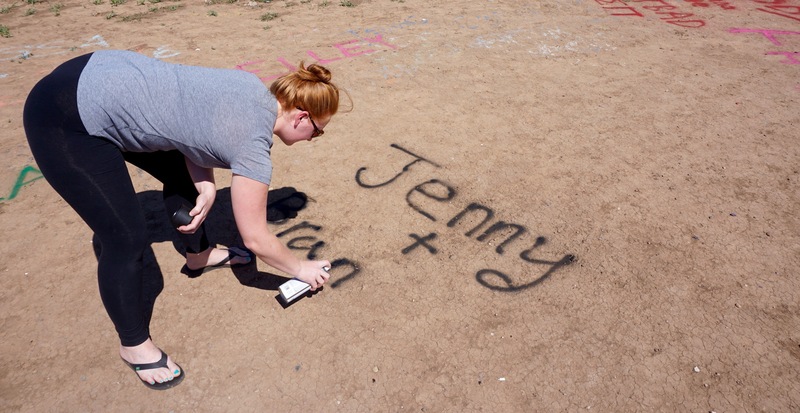 Visitors are encouraged to spray paint whatever they would like on the cars, making the installation a sort of ongoing community art project. Supposedly most of the cars are actually vintage Cadillacs but it is nearly impossible to tell through the many layers of paint. At this point the cars appear to have been made of paint. Wear mud boots. The area immediately surrounding each car was basically a mud pit. Our choice in footwear severely limited our choice of where we could paint on the cars. All of the prime spots would require us to stand in the muddy water. 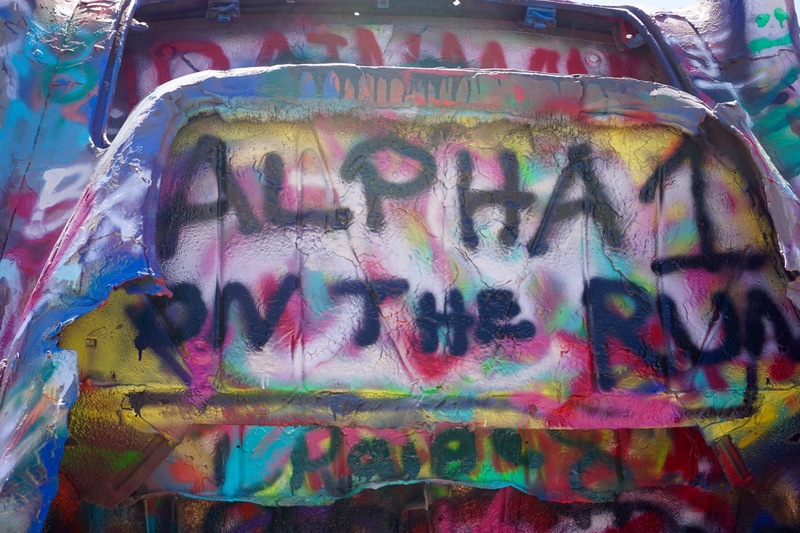 Bring better spray paint and in multiple colors. The only spray paint we had on board was some plain black spray paint. It was very difficult to paint with any detail due to the thick spray pattern. A spray paint with a narrower spray would have helped. And multiple, bright colors would have been much more fun than boring black. Go early in the morning or late in the evening. We were there around noon and it was very hot and crowded. Bring a trash bag to pick up empty spray cans. The spray cans are everywhere. I think people leave the half empty cans for the next visitor that forgot to bring any paint. That’s great but for the most part I just saw people pick up cans, test them, and throw them back on the ground because they were empty. I wished I had brought something to put the trash in and carry it back to throw away. Technically not my problem, but I think it’s a good thing to pick up litter in places like this, leave things better than we found them, be a good steward of the earth, ect. We do the same thing on Jeep trails, though there it’s usually beer cans and shotgun shells and not paint cans. Finally, prepare to be underwhelmed when you arrive. From the road the cars look very small and there were not as many as I expected. And the stream of people walking to and from the cars somewhat diminished the allure. I suspect this is the case with many roadside attractions. The story is always larger than life. Underwhelming as it was, I would still go back, even if only to see if we could still find Alpha 1. Previous Previous post: Willkommen to Fredericksburg! I wrote this once after i logged in i don’t see my comments so i hope its not in twice! I don’t think my old-timers is that bad! I’m so glad you stopped at the airplanes I’ve driving by it so many times but never stopped. I was there first about the 4th grade. My daddy took us there then. 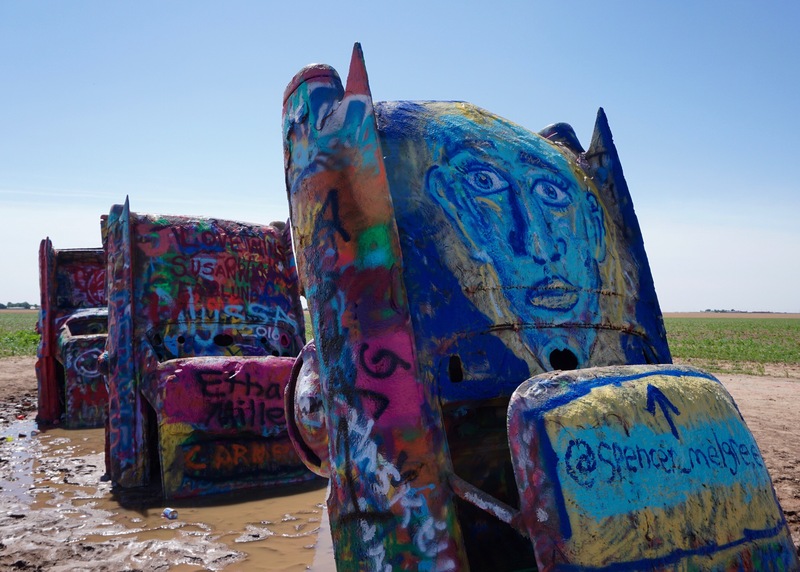 I saw the Cadillac ranch before they started painting them i remember one was pink! I don’t remember when i saw it first.